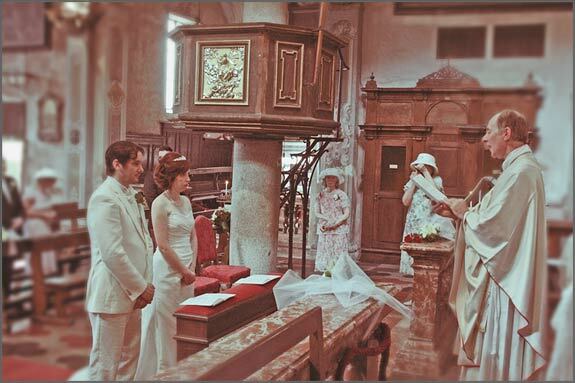 Welcome to part 4 of our Summers Season Wedding in Orta appointment. I will give an overview on some of the events we followed during 2009 summer in 5 posts. 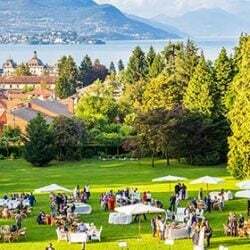 The thing Summer Season Weddings have in common brides and groom choice to opt for Villa Bossi and its wonderful garden to celebrate their civil ceremony. 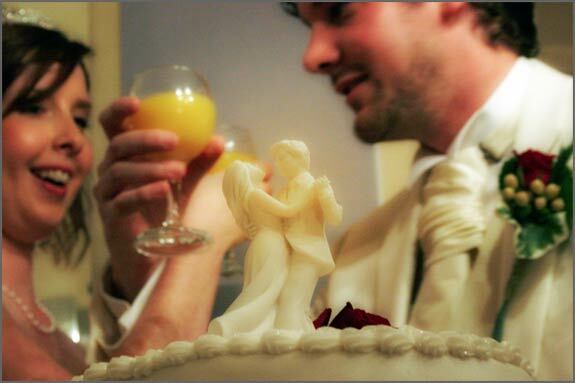 Every single couple personalized and made their event different and unique in all senses. And so Maria and Chris did. 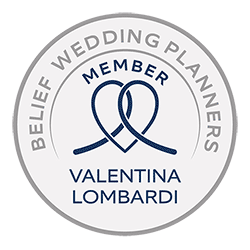 Maria and Chris chose to celebrate their ceremony in the garden of Villa Bossi first and the in the wonderful church of Assunta for a moving blessing. Maria and Chris’ wedding was a simple and cosy event, they just wanted to have it this way! They came here with few friends and close family from United Kingdom. 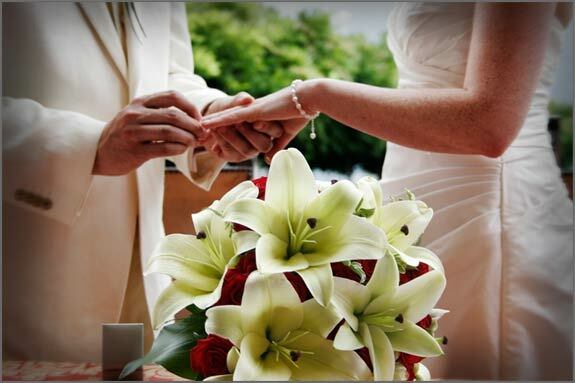 Maria and Chris decided to arrange a different event but at the same time it was really really romantic! 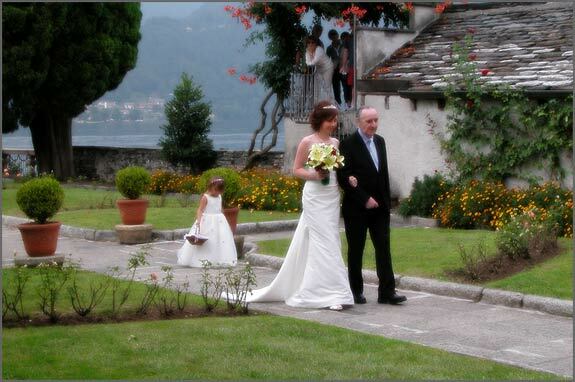 For once in Orta history bride did not arrived by boat but from narrow and medieval roads in Orta village. She was with her father and at their arrival a lovely flower girls was waiting for her as a surprise! The ceremony was held in front of few people and it was very touching! 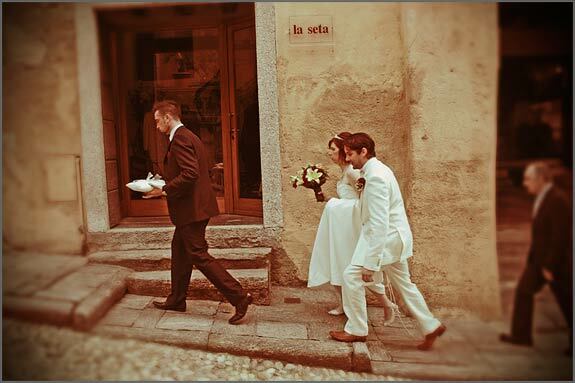 After the ceremony bride and groom with their guests took they road in Orta to reach Maria Assunta church one of the pearls of this medieval village. 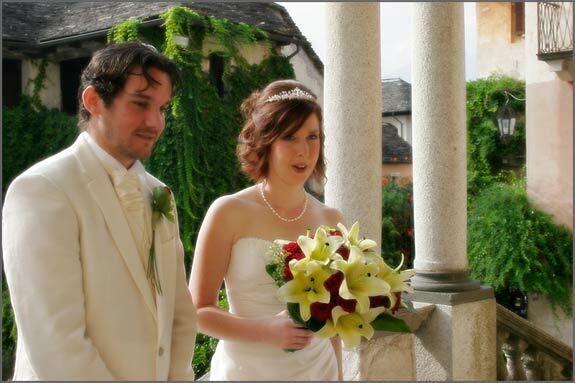 Maria and Chris arrived in front of the church on the top of the hill among Orta inhabitants’ congratulations and smiles. In the church Maria and Chris wanted a blessing that was performed by their own parish priest who come directly from UK for the occasion. 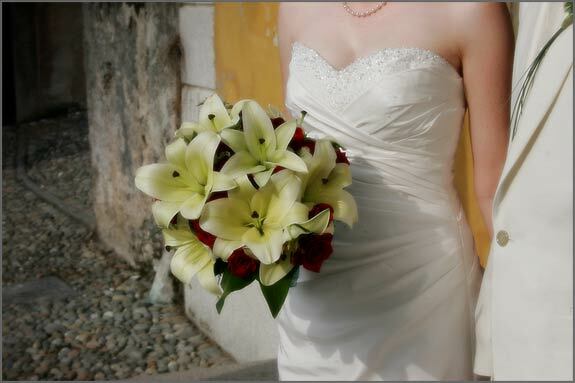 Bridal bouquet was created by Monika Andenmattern, La Piccola Selva’s flower designer. She followed Maria’s wishes and created a tear drop bouquet using colors Maria loved. It was made of red roses and cream lilies. Wedding reception was organized in a traditional restaurant inside ancient part of Orta village. Here bride groom and their guests tasted a totally eco-firendly menu close to the local traditions. Tables for reception followed the same style Maria wanted for the ceremony and bridal bouquet. They were enriched with sweet favors for guests: little organza bags with delicious heart shaped chocolates. An intimate and evocative party, in a real Italian style. Wedding cake at the end was a romantic two tiers one prepared by Costantino Guardia, maitre chocolatier di Torino. Is is Orta and its magic! 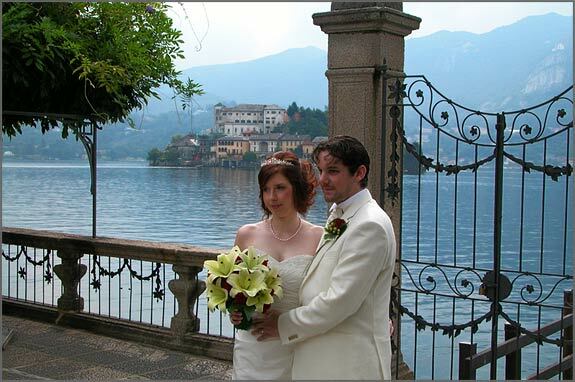 All images: © Italian Lakes Wedding. All rights reserved.